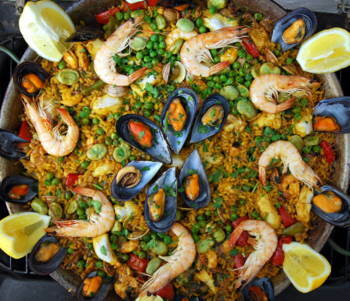 Seafood Paella Recipe David pays homage to the great national dish of Spain, the greatest Mediterranean rice, fish and shellfish dish. There are hundreds of versions, from: Alicante, Murcia, Malaga and Cadiz - to Barcelona and of course, most famous of all: Valencia. 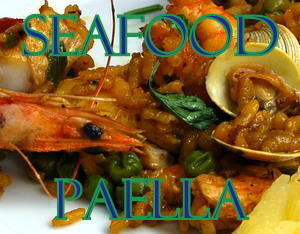 We have tried to capture something of the spirit of Spain in this version - try it yourself - you won't be disappointed. 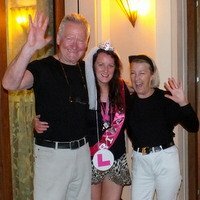 And don't be put off by the number of ingredients - it's really quite simple and the results make the effort worthwhile. 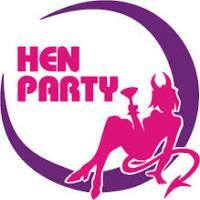 It should be the culmination of a whole day of relaxation, drinking, talking and eating. A labour of love, to be presented with a flourish. 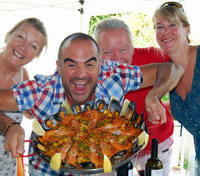 Watch David make a Great Seafood Paella and then come back here for the details. 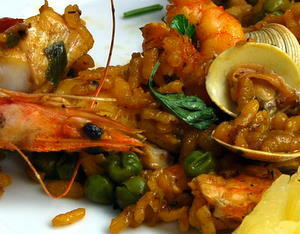 Great Seafood Paella - Easy when you know how. A 13" Traditional paella pan or "Paellera"
Cut the chicken up into 1" dice. Cut the squid into bite-sized pieces. Take off the half shell and reserve the mussels - add any liquid to your stock. Leave the shells on eight of the prawns and shell the rest. OK - add 2-3 tablespoons of the olive oil to your paella pan. Now - on a high heat - fry the onions - mushrooms and red pepper with the chicken pieces and squid - stirring frequently for about five minutes, you want them to color but not burn. Reduce the heat to low and add the garlic and chorizo- stirring for two minutes. Add a little more oil if it looks too dry. Now - replace the pan on a high heat - add half the stock and give it a final stir. Arrange the fish and prawns in the liquid with the shell-on Prawns on top. Let the liquid reduce until there is almost none left and then remove from the heat. Arrange the mussels around the rim of your paellera. Cut the lemons in quarters lengthwise and arrange around the rim.